Returning home after a long day at work and tipping out our belongings on the closest surface we can find is an all too common trait. We know full well the morning after will be spent searching for your keys and cards - yet day after day the cycle repeats. Well, I broke out of that cycle two years ago. Not through willpower but through a valet tray gifted to me (still in use today). I now had a dedicated place to put my everyday carry (EDC) and have made it a habit to use. The result? My morning routine takes half the time and has led to me keeping other parts of my life tidier, including the man cave. Valet boxes, nightstand organizers, jewelry trays—whatever you want to call them—are designed to keep phones, cards, jewelry, cash and all your loose knick-knacks organised and in one place (rather than living between couch cushions.) It should to be easily accessible - on your bedside table, next to the door, etc. Being a "luxury" item, they can reach exorbitant prices so it is important you go in with a price range in mind as well as a specific material and style. To help you out we have handpicked our favorite valet trays that won’t break the bank. Dimensions (LWH) 10" x 8" x 3"
Saddleback Leather Co. has over two decades experience in leatherworking, making everything from wallets & belts to backpacks & satchels. The craftsmanship that goes into each piece is incredible so it’s no surprise that their valet tray makes this list. Reinforced copper rivets connect five pieces of high-grade pigskin leather (four strips and one base layer). The quality is far superior to faux leather. It is more resistant to damage, gets better with age, and has that iconic scent only found in the best. Four styles available: dark coffee (pictured above), black, tobacco and chestnut. They feature different colored rivets and stitches so we highly recommend viewing each item in detail. With products like this, stitching is the first thing to break. It is shocking the effort craftsmen go through to source the best materials and dedicate weeks of their lives painstakingly building something from scratch only to finish with poor stitchwork. Saddleback Leather must share that feeling because they use industrial, weather-resistant polyester thread to ensure the stitching lasts as long as the leather. The only downside we found is that it isn’t phone-friendly. Aside from having no hole to feed a charging cable through (unless you want to drill one yourself), glass screens are easily scratched by metal objects sharing the same space. Catchalls are great at catching all. Organization, no so much. All in all, this full grain leather tray is impeccably designed and crafted, making for the perfect addition to any man cave theme. The makers are so confident in it that they offer a 100-year warranty. If, however, one compartment just doesn’t cut it, this next one will be more your taste. Dimensions (LWH) 10" x 7.1" x 2"
This faux leather organizer is affordable and features an abundance of storage room for your valuables. It isn’t made with authentic leather, nor is it part of a company backstory you’d read in Vintage Weekly, but don’t let that fool you because what it lacks in the luxury it makes up for in everything else. Size being the first thing. It is larger than everything else on this page, spanning 10 inches long, 7.1 inches wide. Ensure your dresser has enough room, you don’t want it dangling precariously off the edge. Despite being cost-effective, the material punches above its weight when it comes to quality, texture and durability. The lighter suede interior contrasts nicely with the dark leatherette and is as soft as a microfiber towel. Its five compartments are designed to hold specific groups of items, each varying in shape and depth. The top left ones, for instance, are perfect for phones, cards and a wallet. The bottom left section is ideal for cradling bills and coins. The one sporting a leather lid is ideal for glasses and medication. The bottom right section is for, well, everything else still hiding in your pockets. Verdict: This handy organizer will serve you so well you won’t think twice about replacing it after a few years when it inevitably comes apart. It looks and feels like the real deal and is the mark of a man prepared for the day ahead. 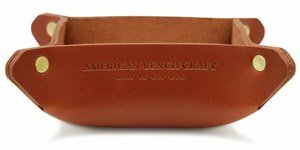 Dimensions (LWH) 4.3" x 4.3" x 2.5"
American Bench Craft was founded by two local brothers on a mission to create a wallet that could stand the test of time. After achieving that, they quickly expanded their product range with tote bags, coasters and everything in between. One of their lesser-known products, this leather catchall basket, is made from a single piece of vegetable-tanned leather, scored in each corner, folded up in a bowl shape and tightly secured by four metal rivets. Vegetable-tanning replaces water molecules left in the hide with tannins from bark and plants, stopping collagen from breaking down and rotting. It is much safer than chrome-tanning—the popular and controversial alternative—since it uses organic materials instead of that which produces carcinogens. It is also the old school, artisanal method of tanning. You have a choice between two colors: tanned brown (pictured above) and jet black. The first is glossy on the outside and soft on the inside whereas the black has a similar texture all over. Even the choice between gold or silver rivets is in your hands. Once decided upon (we recommend black leather with silver rivets and brown leather with gold) the next step is embossing. For a slight bump in the price you get up to three letters heat-embossed onto one side - personalization not available in mass-produced alternatives. Like the wallet that started American Bench Craft off, this catchall stands the test of time. And they have put their money where their mouth is, offering a lifetime guarantee with every purchase. Dimensions (LWH) 9" x 8.6" x 6.5"
This is part of the next generation of storage organizers. There is no tray in sight, no leather to polish, just two slabs of solid walnut positioned in a unique way. Both pieces of wood are roughly the same weight and size but, like jigsaw pieces, have grooves that fit each other. The horizontal piece has a slot that spans 90% of its own length, as well as a bell-shaped section cut out for a charging cable to be fed through. The other piece (angled roughly 80 degrees) slides into the slot securing it in place. It too has a groove designed to fit a hide a cable. Finely sanded, the wood is also finished with a protective agent to keep moisture out and give it a glossy, even surface. Available in two colors: light/mixed (pictured above) and dark. Due to the nature of walnut, expect to see differences in patterns, color intensity, texture and feel. But that’s part of the beauty of wood - each one is unique. It is easy to assemble, premium from top to bottom and is the perfect addition to a nightstand, bedside table or dresser. Even the rustic gift box it ships in feels high-quality. Valet trays are great for adding style and functionality to your man cave. No, they aren’t considered a must-have. You could resort to a soup bowl or cardboard box, but there is something strangely right about having a fit-for-purpose container to hold everyday carry. Maybe it’s the symbolism. Maybe it’s knowing the effort it takes into creating one. Or maybe it’s just the scent of leather triggering a release of serotonin in the brain.